Although we don’t like to think about it, the truth is most children will experience the death of someone close to them. According to Childhood Bereavement UK, 92% of children will have experienced a ‘significant’ bereavement before the age of 16. So having a book or two to hand isn’t just a good idea for families like ours, it’s a good idea for any family. As I said in yesterday’s post, I’ve been on a bit of a spending spree lately – curious to find out more about the books that are available and to find one that fits with the conversations that Saskia and I (and her young friends and their parents) have been having lately about Ben. And I’ve discovered some amazing books – some heart-breaking, some bizarre, some practical, some metaphorical. 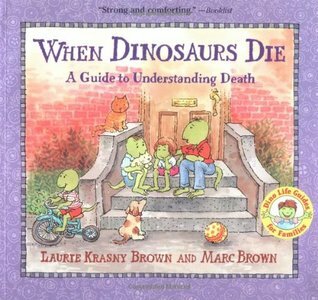 This is a non-fiction book with page headings such as ‘What Does Alive Mean?’ and ‘Why Does Someone Die?’, and is all told in cartoon-strip style by a host of unusual looking dinosaurs (not like any I learned about at school). It deals with everything from reasons for death, to feelings about it, different ideas about what happens after life, and ways of saying goodbye. Its target audience is obviously older than Saskia as a three year old, and there are parts that are too sophisticated that I would skip over, but in general its pragmatism is a really good fit for the very literal kind of questions that Saskia, and her friends, tend to ask. Also, with its non-fiction format, it isn’t as emotionally charged as some of the story books – which can be saving grace sometimes. This is one of the heart-breakers, as you can probably gather from the title. 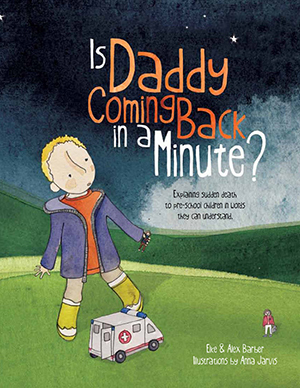 It’s a richly-illustrated picture book, with real life dialogue between Elke and her three-year old son Alex after the sudden death of his father from a heart attack. The latter half of the book will be particularly valuable to us, as Alex asks Elke questions such as ‘Mummy, will you have to die?’ and ‘Who will look after me when you die Mummy?’ and she gives wonderfully vivid, easy to understand explanations, using pictures and nature to show what she means. I can definitely see myself turning to this as a reference book for inspiration on how to answer these tricky questions. This book will delight you then with the turn of a page completely take your breath away. The dancing rhythm of the words and childish simplicity of the pictures belie the rich and poignant subtext of loss, memory and regeneration that suddenly come into the story. Though the impact of this subtext is powerful to adults, for very young children it is so subtle that most would be unaware of it. At three, Saskia loves the book simply for its music, humour and imagination. As she gets older, its beautiful and positive messages will no doubt begin to sink in and move her as they do me. 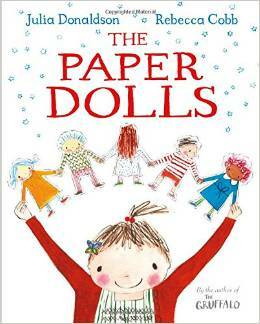 In this book, the illustrator of The Paper Dolls, Rebbecca Cobb, is both illustrator and writer. 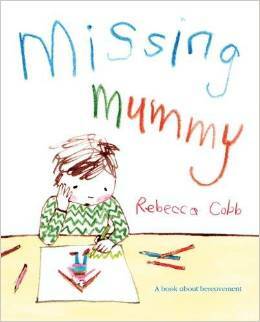 Told in first person by a young child (helpfully the gender is not explicit so we say she’s a girl) whose Mummy has died, the story deftly tells of her confused feelings about her Mummy’s death and then of how, through talks with her Daddy, she comes to understand more of what has happened and what her feelings mean. This book has worked out well for us and for a few weeks Saskia chose it every night as one of her bedtime reading books. The reason I like it is that it has a very light touch, the minimal text only glancing over the different emotions and themes. This makes it easier to weave our own story into it, and skip over less relevant parts and draw out and explore more relevant ones. Don’t get me wrong though – its lack of detail doesn’t mean lack of depth – it’s simple text and pictures cut right to the heart. First published in 1982, this is the oldest of the books I have. It’s an allegorical tale about a colony of water bugs who wonder what happens to their friends when they disappear above the water, never to return. They promise to come back to tell if it happens to them, but when one of them finds himself climbing up the lily stalk and transformed into a dragonfly, he realises that he cannot go back below the water any more. Instead, he flies away on the breeze, knowing that his friends will discover the truth for themselves one day. It’s a lovely way of painting the afterlife, and one that can be adapted to any creed. The big drawback, however, is that the small and delicate water colour illustrations are not like the large and engaging pictures that modern children are used to in their books. It’s certainly not a book that will catch Saskia’s eye, but then it’s an easy story to remember and retell so can stand alone without the book itself. 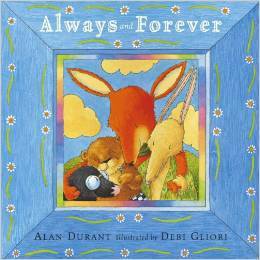 Always and Forever is about a group of woodland animals whose friend, Fox, gets ill and dies. After a long period when they lock themselves away with their sadness, a visit from another friend, Squirrel, helps them to start celebrating their friend’s life rather than just commiserating his loss. It ends with them talking about how Fox will live on in their hearts and memories forever. This would be a lovely book for children who are suffering grief and seeing their families go through it, helping them to see ways back to happiness, and to know that it is ok to feel happy. This is a bizarre one and takes some getting used to. 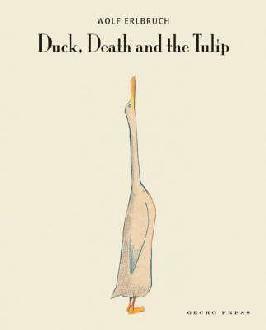 The two characters are Duck and yes…Death – no scythe or black hood, but he is a skeleton in a dress, and therefore not at all the kind of character most Brits would be comfortable with in a children’s book. I say Brits because Erlbruch is German – I don’t know much about German culture but perhaps it’s a more common sight in their children’s literature. I’m fascinated by its unconventionality, and my slightly appalled gut reaction to it. I also feel an affinity with its message that death is always with us, a part of life that we should not fear. I read it to Saskia once – she quite liked it, and asked for a second reading. It certainly didn’t spook her. But I think it’s too old for her in general – the colours are too washed out and spartan, the themes too abstract to appeal to her at this age. Maybe when she’s older – although she might be as weirded out as I am by it by then! So that’s the lot – a collection that I hope will be useful to us both going forward – and maybe to friends and family too as they face the little darlings’ tough questions. If you’ve read any of these books, or any others, and have any comments to add, I’d love to hear them. Categories: Talking to children about death | Tags: child talk, children and grief, children's literature, explaining death to children, grieving | Permalink. 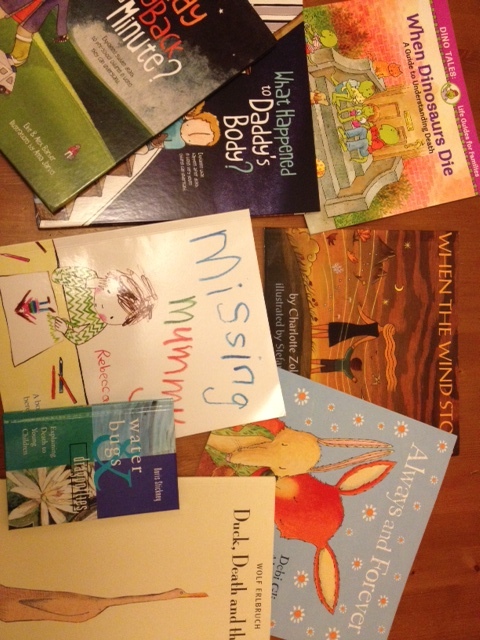 Not long after Ben died I started searching around online for books for children about death and bereavement. I found a few books that I ordered but nothing was quite right. For a long time I didn’t bother with any more, but recently, after conversations with friends who are keen to know what’s out there for them and their children (as they’re kind of in this with me – they need to answer their two or three year old’s questions about where Saskia’s Daddy is), I decided to do a bit more research and get hold of some more. I now have quite a stash (rundown of these to follow in my next post). Of course, as curious as I am to see what Saskia makes of them, it’s not right to inundate her. With reading, as with our conversations, I want to draw on the books in response to what she says and what’s going on in our lives, rather than force the topic on her. I actually see them more as a resource than anything – books to introduce when the need arises and pages to refer to for ideas about how to explain a certain thing. After all, unlike most books for children of her age, there’s inevitably a lot of sadness in them – why dwell on this if she’s ok and happy? This is a bit of dilemma for me with one particular aspect of the books: the fact that most of them are told from the point of view of characters (some are animals, some are young children) who are grieving: suffering sadness, guilt, fear, anger. Saskia is happy – her very young age when Ben died (only 16 months) and the fact that he didn’t disappear suddenly, but slipped gradually from her life due to his illness – means that she hasn’t as yet suffered the typical feelings associated with grief. So to an extent I’m concerned that these stories might give her the impression that she should be feeling sad, that this is the normal or right way for a child to feel. On the other I think, well if she ever did begin to feel feelings of grief, at least through reading the books we would have opened up doors for talking about it. As usual, I’m probably over thinking and common sense is all that’s needed. I certainly won’t force the books down her throat, but I won’t hide them away either. They’ll be on the book shelf with all the others, and if she wants to read one then great, and I guess we can talk about the feelings that the characters are going through and chat about what she feels or doesn’t feel. It’s me that goes through all the angst about this after all – she tends to just proclaim ‘Next! or ‘Again!’ without a slither of apparent emotion! I’ll write more in my next post about the books we’ve got and which ones I recommend. 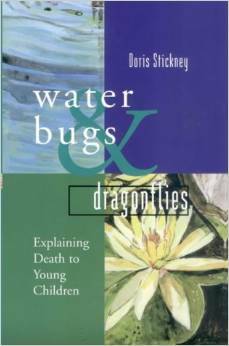 Categories: Talking to children about death | Tags: children and grief, children's literature, explaining death to children, grieving | Permalink. On Sunday afternoon we met up with Lizzie, Liam and the boys down at the creek. As soon as Saskia saw Liam, the first thing she said was ‘My Daddy’s in heaven’ – she’s saying this a LOT at the moment as you may have gathered! Funny though, that she should do this again having greeted him the exact same way a week ago. The need to talk about where her own Daddy is when she meets her friends’ Daddies seems really strong at the moment. Or even just the mention of Daddies, will set her off, telling whoever’s listening all about her own. Just yesterday, she was telling her friend Emmeline all about how he was poorly and so he had to go to heaven. She got a bit confused at one stage saying it was because he was old, but overall she’s very keen and confident about talking about him, which I’m really proud of. I do already try to do this whenever opportunities arise. Ben’s things around the house are ideal starting points for me to tell Saskia about things he liked, his character and his experiences in life. 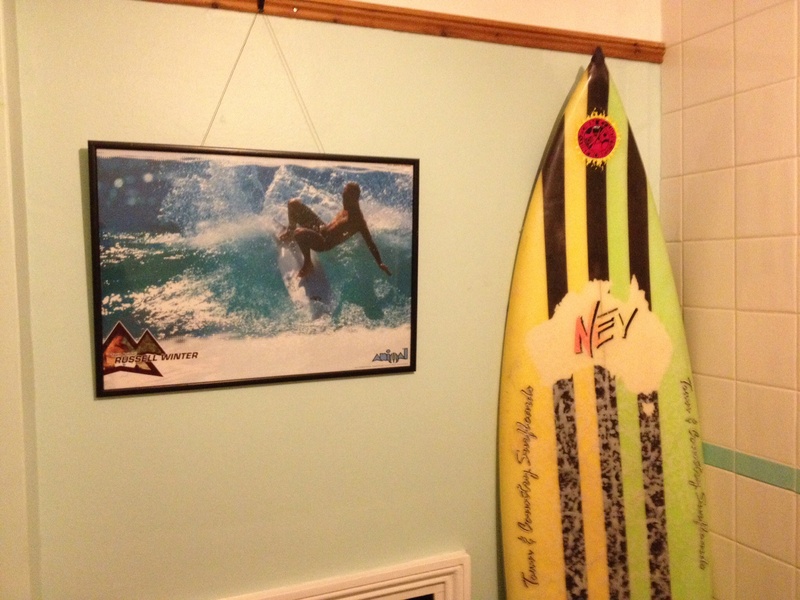 In our bathroom there’s a picture of a surfer, and an old surf board that Ben’s school buddy and surfing mentor, Dave, gave to him. Quite a few times Saskia has asked me about them and it’s been a lovely opportunity to talk about how Ben loved surfing, took me surfing, and latterly fantasised about living his surfing ambitions vicariously through her. To be honest, I was never a fan of the photo or the surfboard as additions to our bathroom decor, and put up with them under sufferance. But now they’re there to stay – partly because of the way they bring Ben into the room and generate memories for me, and stories about her Daddy for Saskia, but mostly because Saskia thinks the super buff surfer ripping up the waves is actually Ben, and I couldn’t possibly disillusion her! Categories: Talking to children about death | Tags: children and grief, explaining death to children, heaven | Permalink. Disobeying all the right advice about blogging, I haven’t written for ages, but have instead hoarded bagfuls of stuff to write one day when I got round to it. Could this finally be the big blaaah? We’ll see. Where to start? Well this post is to be about Saskia, my conversations with her about Ben and death, as well as the conversations that my friends and I have overheard her having with her little buddies about the same thing. Anyone who has watched a child go through the first years of life will attest to how utterly lovely and endearing it is when somewhere between two and three they start having their first proper conversations with their friends. They have all sorts of serious little chats, very earnestly debating this or that. Jack: My Daddy’s at work. Saskia: Daddies don’t go to work! They go to heaven. Jack: My Daddy DOES go to work. Me: That’s right. Jack’s Daddy works in Canterbury. He’s a manager. And so I wittered on, commandeering their conversation in my parenty way. It’s that matter of fact way she says things…like that’s just the way it is. That, plus the funny way her and her friends make confident pronouncements as though they are the absolute authority on a subject that they’ve only just learnt for themselves about 3 seconds previously. On any other subject it’s all just funny. With this it’s tragic and funny – she makes me smile, even though what she’s actually saying is sad beyond her imagining. Lately Sas has learned that DADS = FUN. Mums are alright, but Dads do really good stuff like charge around pretending to be monsters, and hilAAAARIOUS pantomime style goofing around at the swings. So now I get ‘Mum, be funny like Adam and Dan’ when we go to the park and I either have to feel totally inadequate or like an utter prat. We’re so lucky to have such brilliant Dad friends who always make sure she gets swung around in the air and held upside down by her ankles just as much as their own eager urchins. However, as I’ve noticed how much she revels in this interaction, I’ve also been watching closely for signs of resentment, or sadness, that her own Daddy isn’t here. After all, with anything else, be it food, toys, a manky old stick or a bit of fluff, if anyone else has got something that she hasn’t, she’s in a wild fury of hot tears at the injustice of it. But so far, this injustice, she seems to be taking very calmly. Last week, Sas and I were at the pub with Lizzie and Janine and their children, enjoying a cheeky Friday afternoon couple of pints. A little later, Lizzie’s husband Liam joined us after finishing work. As he walked in he kneeled down to hug his two boys, and then Saskia came up to him and announced, ‘My Daddy’s in heaven.’ No drama, just that. And Liam accepted her pronouncement with an easygoing ‘That’s right’ and a smile, and carried on with the everyday chat about what the day had held for us all. The things she says are all the more poignant and moving for the unremarkable way that she says them – because it’s just normal for her I guess. I’m sure it touched Liam – later that evening I noticed he had an extra big hug for Sas when we bumped into him at the chippie. Well this is isn’t all the blaaah, but in the spirit of little and often I will post this now and promise the rest soon. Maybe more little people conversations, definitely more about the conversations I’ve had with her. Thanks for reading. Categories: Talking to children about death | Tags: child talk, children and grief, explaining death to children | Permalink. Today Saskia was NOT HAPPY, or so she told me. She also described herself as ‘grumpy’ and ‘sad’, not feelings she’s prone to I’m proud to say. Usually I can shake her out of any grump with tickles, cuddles, offers to play with her, or the big guns, cake or telly. But today she didn’t want ANYTHING!! as she hotly exclaimed on several occasions. Whether sad and grumpy were just her ways to express her being dog tired, which I knew she was, or her voicing a deeper unhappiness, I don’t know, but in the midst of her whining and whimpering this afternoon, she suddenly came out with ‘I need my Daddy!’, then she just cried ‘Daddy! Daddy!’ over and over again for maybe five minutes. Eventually she stopped as she began to drift off to sleep in my arms. I was shocked, and really sad for her. This is the first time she’s shown strong emotion about not having her Daddy. My instinct is that she was feeling rotten – exhausted after a run of late and restless sleeps – and was so out of sorts that she felt she didn’t want anything, but she wanted something. Something, or someone, who was missing, but could look after her and make her feel better. I asked her what had made her think about Daddy and she said it was Pickle, our cat. She knows he was Daddy’s cat, bought especially to cheer him up when he was poorly. The last few days have been relatively intense in terms of talking about Daddy, and death. On Sunday we visited the burial ground, and Saskia brought a new stone that she’d chosen on the beach in Cornwall to go with the one she’d brought to put by the tree on January 3rd. And yesterday we attended the committal (just the burial part of a funeral) of Ben’s Nan. Although Sas asked questions about what was going on, she didn’t seem upset at all at the time – she was much more concerned with taking her shoes and socks off so she could run barefoot in the grass! Who knows what she’s absorbed, what she’s understood and what she’s taken to heart, but it’s very possible that the events of the last few days were jumbled up with her unhappiness when she cried for Daddy today. Poor Sas. There will be many more moments like this ahead as her loss gathers meaning in her mind. I still don’t feel I have the right words. I’m just hoping that cuddles and kindness will be enough for now. When I picked up The Snowman DVD box set for Saskia’s stocking this Christmas, I was really just thinking of it as a cosy Christmas classic, feeling sentimental about watching it as a child and imagining how she’d love it. She has absolutely adored it, and this rainiest of Januarys has, in our household, been a snowy one, with regular viewings (I confess often several times in a row when I’ve bowed to her toddler-dictator demands) of both the original 1982 film and the modern sequel The Snowman and the Snow Dog. But I’d completely forgotten, and perhaps just been so swept away with the gooey Christmas nostalgia that surrounds the film, that it’s as much about death as it is about flying through the air and meeting Santa. 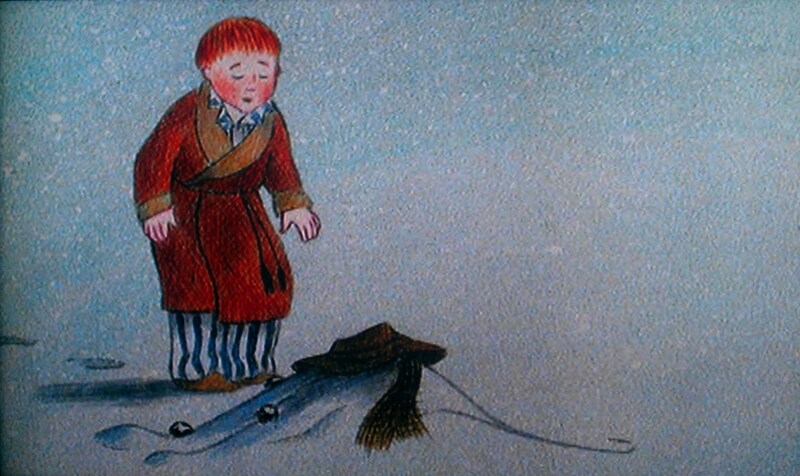 Both films end with a young boy knelt sadly beside a mound of snow and a few clothes – all that remains of his melted snowman friend. 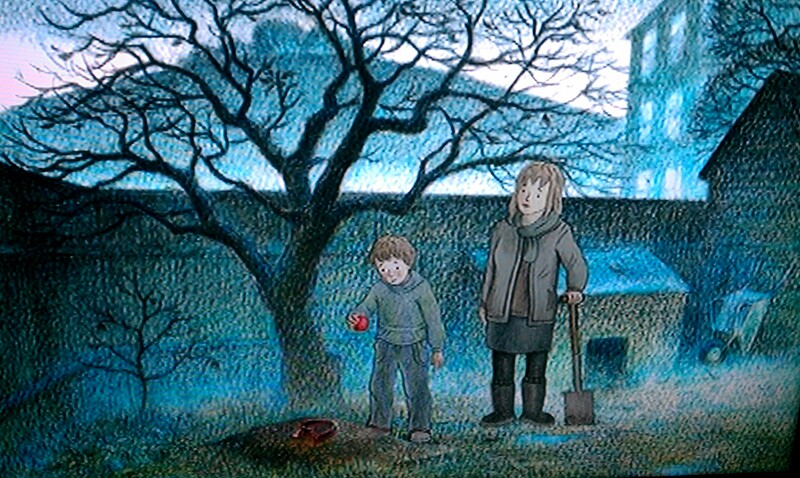 In the Snowman and Snowdog sequel, death appears right at the beginning of the story too, when the boy’s dog dies and he and his Mum are seen burying him in the garden. When I watch this scene I am struck by how resonant it is of our recent trip to Ben’s grave. There’s a tree, a mother and a child, and treasured objects laid on the grave. I’ve been watching to see if Saskia has made this link and I don’t think she has, certainly not as strongly as I have. I don’t want to push it, but I did mention once as we watched that the tree was like Daddy’s special tree. She didn’t really say anything, and usually now when we’re watching, she adds her own commentary for me (in case I’m getting lost in the complexities of the plot) and when we get to this point she let’s me know “the doggy’s died, Mummy” in the same, rather pleased with herself way that she narrates every other scene. No great feelings of poignancy apparent! What I like, I guess, is that these films deal with death in a way that is matter of fact, and sensitive. I know that both films are sentimental, and that the 1982 film sugar-coated the original Raymond Briggs story by adding the Christmas elements, but I don’t mind that so much. I just appreciate the fact that on some level the stories are teaching Saskia the idea that death is a fact of life – we will all die, just like a snowman will always melt. So far we haven’t come across many stories (either in books or on film) that feature death so this has been an interesting first for us. I would be really interested in recommendations for stories that deal with death sensitively from anyone reading this – it’s a theme I’d like to revisit in a later post I think. Finally, for your interest, here’s a link to an article in the Independent in which Raymond Briggs talks about the theme of death in his book and how the story was ‘hijacked’ by Christmas. Categories: Uncategorized | Tags: children's literature, explaining death to children | Permalink.